Lose the brassy yellow and embrace silver and ash tones. 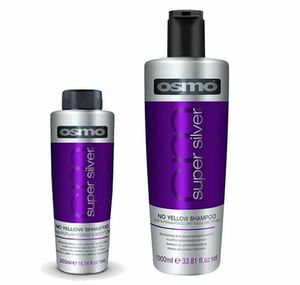 Osmo Super Silver No Yellow Shampoo is a brilliant product for use on super-lightened, grey or bleached hair. It's been specially developed to reduce unwanted yellow tones and change the hair colour to silver/ash tones instead. It's perfect for use on natural and synthetic hair types and has been formulated with extreme, super-violet pigments to combat any unwanted brassy tones. Simply apply to wet hair, lather and leave for 3 to 5 minutes to begin restoring colour vibrancy to your clients' hair. £7.56 (inc. VAT) Why no VAT? We're a trade wholesaler and quote our prices without VAT to help our VAT-registered customers understand the true cost of a purchase. Brilliant 'no yellow' mask treatment infused with super violet pigments for use on super-lightened, grey or bleached hair. Available in 100-ml pot, 250-ml tube or 1000-ml bottle. Sulphate-free conditioner that neutralises yellow tones without stripping colour while leaving hair soft and shiny. Comes in 300-ml or 1000-ml bottles. Restore colour radiance and banish yellow tones with this nourishing mask for blonde and highlighted tones. Comes in a choice of 3 sizes: 100 ml, 300 ml or 1200 ml. Restore radiance and protect against brassiness with this leave-in styling and toning spray for blonde and highlighted hair. Comes in a 125-ml spray.